The Gunslinger lives in the legendary west. He is a ronin Samauri with two six guns in place of the two swords, striding into town. He is a man who always knows what to do and is faster than lightning. Clint Eastwood played the archetypical Gunslinger. The legendary Stock Picker lives in the land of excess profits. These men and women are profiled in Smart Money magazine and the Wall Street Journal. They always know what stocks to pick and they deliver fantastic returns. Warren Buffet frequently given as the exmaple of the archetypical stock picker (despite the fact that he largely delivered the fantastic returns by purchasing companies, not stocks). Although not as mythological as the Gunslinger, there are few consistently successful stock pickers. Actively managed mutual funds rarely beat index finds, especially after fees and taxes are accounted for. Many mutual funds with returns that beat a market index (the ideal in a fund) tend to have turnover as high as 100% or more (e.g., in a year's time the stock in the fund portfolio will have been replaced by an entirely new set of stocks). This can incur taxes of almost 40 percent for taxable money. When taxes are factored in, the return of a high turnover fund can be considerably less than an index fund. During the 1990s the majority of actively managed mutual funds have failed to beat market indices (e.g., the Standard and Poor 500). Since the overall market is rarely beaten with any consistency, why not simply buy the market? This logic has lead to the popularity of index funds. These funds have low turnover and low fees, which also enhances their return relative to many actively managed funds. In What Works on Wall Street: A Guide to the Best-Performing Investment Strategies of All Time, James O'Shaughnessy points out that one reason that index funds are successful is that they have a simple investment formula, which never changes. In good times and bad, an index fund buys the market. Consistency is an important factor to long term investment success. Is there, then, no way to do better than the overall market? Value investing has been one method that, during the 1970s and 1980s delivered superior returns. The pioneers of value investing (as opposed to stock market speculation) are Benjamin Graham and David Dodd who published the first edition of their classic book Security Analysis in 1934 (Warren Buffet is Benjamin Graham's most famous student). The value investor attempts to invest in under-priced stocks (stocks that are currently selling near the "book value" of the company), with low price earnings ratios. In theory these stocks will rise over time as the market recognizes the value of the company. Computers did not exist when Graham and Dodd published the first edition of their book. Even in the 1970s, when Graham published later work (e.g., The Intelligent Investor), computers were very expensive and were only available to corporations and large universities. Information flows faster. The US stock market has become more liquid, with many more investors. The increase in investment has resulted in an increase in the number of stock market analysts that follow large and medium sized companies. Publication of corporate information (e.g., yearly and quarterly reports) on the Internet has made information dissemination very rapid. This makes identifying truly under-priced stocks more difficult. In many cases unrecognized value can only be found in small to medium sized companies which are not covered by many analysts. The availability of cheap computing power and extensive stock market and corporate information databases has allowed the development of portfolio analysis and creation techniques that were unavailable to Benjamin Graham. In What Works on Wall Street O'Shaughnessy shows how data mining techniques can be used to analyze the historical effectiveness of various measures used for creating portfolios. For many on Wall Street, buying stocks with low price-to-earnings (PE) ratios is the one true faith. You find a stock's current PE ration by dividing the price by the current earnings per share. The higher the PE, the more investors are paying for earnings, and the larger the implied expectations for future earnings growth. A stock's PE ration is the most common measurement of how cheap or expensive it is relative to other stocks. O'Shaughnessy points out that investors who buy low PE stocks believe that they are getting a bargain. To see if this is really true he analyzes the performance of low PE stocks over a 44 year period from 1951 to 1994. In this analysis O'Shaughnessy's software picks the 50 stocks with the lowest PE ratio from the Compustat database, published by Standard and Poor's. Each year the the 50 stock portfolio is rebalanced by buying new stocks with low PEs and selling those whose PE has risen. The result does not beat O'Shaughnessy's overall market index. It turns out, however, that if 50 stocks with the lowest PE ratio are picked from a group of large capitalization stocks, the portfolio does beat the market index. For each portfolio algorithm O'Shaughnessy also examines the Sharpe ratio, which measures the risk, or volatility of the portfolio. O'Shaughnessy dedicates a chapter to the analysis of various portfolio algorithms, including price-to-book, price-to-cashflow and price-to-sales, plus various combinations of these ratios. Each test portfolio is rebalanced every year (e.g., stocks that no longer conform to the test criteria are sold and others that fit the criteria are purchased). Each test portfolio is compared to the overall market and to a universe of large and small capitalization stocks. Contrary to the popular "value investor" point of view, the price-to-sales ratio turns out to be one of the most effective predictors for portfolio performance. At least for O'Shaughnessy's model portfolios. The idea of empirically testing the factors used to select the stocks for a portfolio is a powerful one. It is far superior to the ad hoc techniques used by many mutual fund managers. By using empirical analysis, the historical performance of a portfolio and its associated risk can be quantified. The past does not predict the future, but it is the best predictor that we have. What Works on Wall Street is both an excellent and a deeply flawed book. James O'Shaughnessy is a clear and engaging writer and his analysis should be considered by anyone creating a stock portfolio. Despite O'Shaughnessy's talents as a writer and the important results presented, the techniques he uses can only be used by those who have access to market data bases and the software needed to analyze the data. Although software and historical data was available at one time with the book, it is only useful for historical analysis. Since a real portfolio must be rebalanced ever year, this is of no use to anyone who wants to use O'Shaughnessy's techniques for their own investment. Few investors have the resources to spend the thousands of dollars needed to purchase up to date Compustat data and the necessary analysis software. As a result, the techniques advocated by O'Shaughnessy can only be used by those few readers who work for market firms and have access to the necessary data and software tools. Until the mid-1970s, commissions on the buying and selling of stock were fixed by the New York Stock Exchange. Although the actual cost varied with the size of the order and the price of the issue, a typical commission bill came to about 2 percent of the value of the transaction. 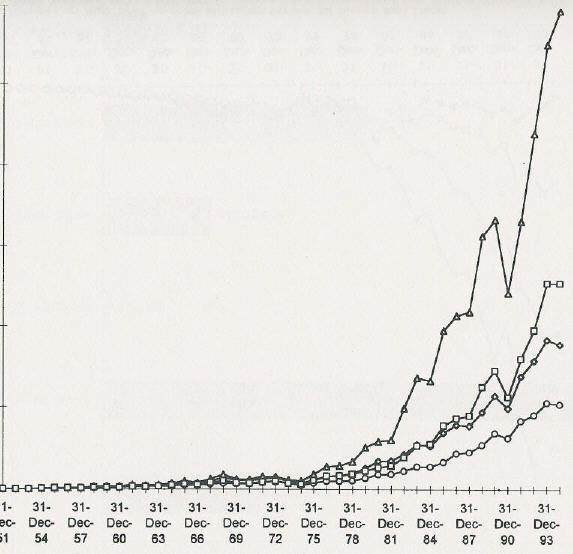 in the 10-year period ending in 1975, the S&P 500 index increased at an annual rate of only 3.5 percent. The era of fixed commissions ended on May 1, 1975 -- a day tearfully referred to as "May Day" by brokerage firms. In this newly competitive environment, transaction costs tumbled; a trade that might cost 70 cents a share to execute could be done for as little as 5 cents a share. The huge decrease in brokerage commissions meant that an investment in the stock market had a lower barrier to profitability. This made the stock market a more attractive investment and created an explosion in market liquidity (e.g., the amount of money invested in the stock market). Running the test portfolios against historical data before 1975 was basically a waste of computing power. The models examined by O'Shaughnessy produced at best mediocre returns until "May Day" 1975. Computing power is cheap, so wasting it is not an issue. But the fact that a market regime shift is uncommented on in What Works on Wall Street shows that while O'Shaughnessy's analysis is valuable, it is shallow. Anyone using a particular investment approach must look for regime shifts which will cause the technique to fail or greatly reduce its yield. In the book O'Shaughnessy explicitly ignores the cost to buy and sell the stocks in the portfolio. He also ignores market impact, which is a significant issue as a fund grows. Market impact takes place when the buying and selling of shares for the fund cause changes in the market price of a stock. Most fund managers, especially hedge fund managers, keep their techniques secret. The motivation for this secrecy is the fear that a successful portfolio strategy will be widely used, which will reduce its profitability. For example, if lots of investment funds started buying low price-to-sales stocks, these stocks would become more expensive, reducing the usefulness of this technique. Markets are dynamic systems, that are constantly effected by the actions of the market players. This is a level of complexity that is ignored by What Works on Wall Street. At the time James O'Shaughnessy wrote What Works on Wall Street he ran O'Shaughnessy Capital Management, which sold mutual funds. Since the techniques described by O'Shaughnessy cannot be used by the average investor, this leaves the suspicion that the What Works on Wall Street was a way of marketing O'Shaughnessy funds, which presumably used the quantitative techniques outlined in the book. After the first three chapters, each chapter in What Works on Wall Street consists largely of a few pages of commentary followed by several pages of tables and graphs. Most readers will read the short commentary, look at the graphs and skip the tables and bar charts. What Works on Wall Street could have been much shorter, but was "bulked up" with tables of numbers. This reinforces the impression that the book is aimed at marketing. That's when it dawned on me that the Internet was indeed going to destroy the fund business. It was going to destroy funds because it could. Deep down I knew that most investors were no longer happy with their funds. The phenomenal popularity of fund investing was already waning. Investors knew they were paying high fees and being socked with unwanted capital gains taxes each year. They knew they didn't even have control over what individual stocks their funds owned. They were also painfully aware that, in many instances, they were earning sub par returns. Here is where the Internet and its capacity for mass customization could play a major role. As I drove along, I realized that the Internet could deliver knowledge and advice to investors. It could meet the needs of those who wanted to create their own stock portfolios to meet their personal preferences. And the Internet could do it all-at an affordable price. It is worth asking how good O'Shaughnessy's advice really was. Several of the model portfolios modeled in What Works on Wall Street produce excellent returns while limiting taxable gains. If a fund based on these techniques produced similar performance, it should attract a great deal of investor money and yield substantial fees. One possible reason that O'Shaughnessy left the mutual fund business is that while O'Shaughnessy's models work well on paper, they work less well in practice. Apparently the O'Shaughnessy funds were sold and are now "Hennessy funds: Hennessy Cornerstone Growth (symbol: HFCGX) and Hennessy Cornerstone Value (symbol: HFCVX). According to the finance.yahoo.com quotes for these funds, neither beat the S&P 500. During the last three years the S&P 500 averaged a return of 17.87%. O'Shaughnessy's "Cornerstone Growth" fund averaged 16.42%. Currently the expense ratio on this fund is 1.15%, so it substantially lags an S&P index fund. On top of this, the fund has a turnover of 125%, so for taxable money this fund will be taxed at a short term capital gains rate of almost 40%. Given O'Shaugnessy's comments on the tax inefficiency of actively managed mutual funds, it is deeply ironic that his funds have high turnover. The "Cornerstone Value" fund did even worse, with a average return over three years of 6.20% and an expense ration of 1.38% and a turnover of 123%. Treasury bills were far and away a better investment than the value fund. With mutual fund success like this, an Internet venture might have looked attractive. When I managed The O'Shaughnessy Funds, my goal was to bring to the public the same quantitative investment strategies that I had provided to wealthy clients. Then earlier this year, the Internet allowed me to launch Netfolio, Inc. and offer you something even better than mutual funds. Apparently when O'Shaughnessy's methods were applied to mutual funds, they performed poorly. O'Shaughnessy admits that in some years his model portfolios lag the market. The implication is that we should trust the methodology and stick with it through good times and bad. In the end we will come out ahead. Perhaps. But how do we know. Since O'Shaughnessy ignores issues like regime shift, how do we know whether or not his methodology is too simplistic? Is the performance of the Cornerstone funds simply a down period for a basicly strong investment technique that will do well over time or is the approach flawed? Although the past is the best predictor of the future that we have, predicting the future from the past is never easy. Nothing that is written here should be interpreted as reflecting the views of my employer. This review was written on my own time, using my own computing and Internet resources. The bearcave.com domain is mine and these opinions are not necessarily shared by anyone else. Obviously this is a book review, and so, a critical work. As a result, all quotes used in this review fall under the doctrine of fair use. In writing this review, I am not engaged in rendering professional services. If professional advice or other expert assistance is required, the services of a competent professional person should be sought. To borrow from Dr. Leonard McCoy, Chief Medical Officer of the starship Enterprise: "Damn it Jim, I'm a software engineer, not a licensed investment advisor."